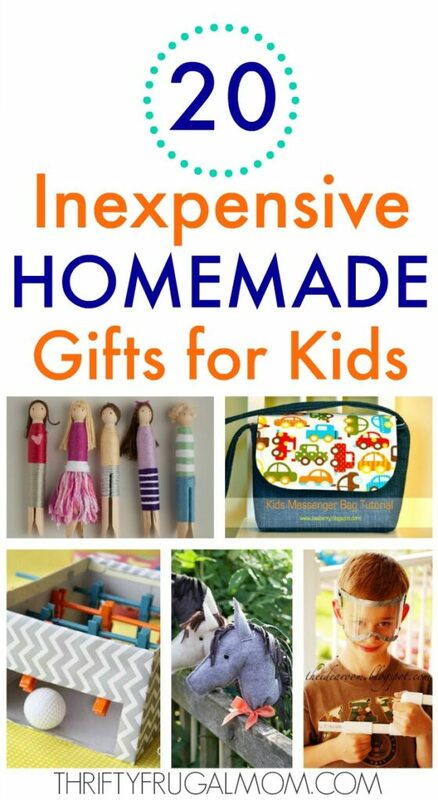 Save money, but still get a great gift with this list of 50 MORE cheap kid’s gifts that cost $10 or less! Perfect for stocking stuffers! 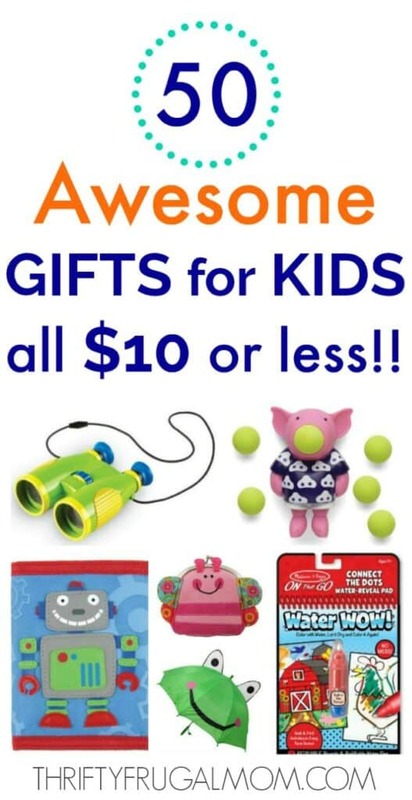 You all loved my first 50 Awesome Gifts for Kids That Cost $10 or Less, and since I was once again looking for some cheap kid’s gifts myself, I thought I’d do another collection and share it with you. 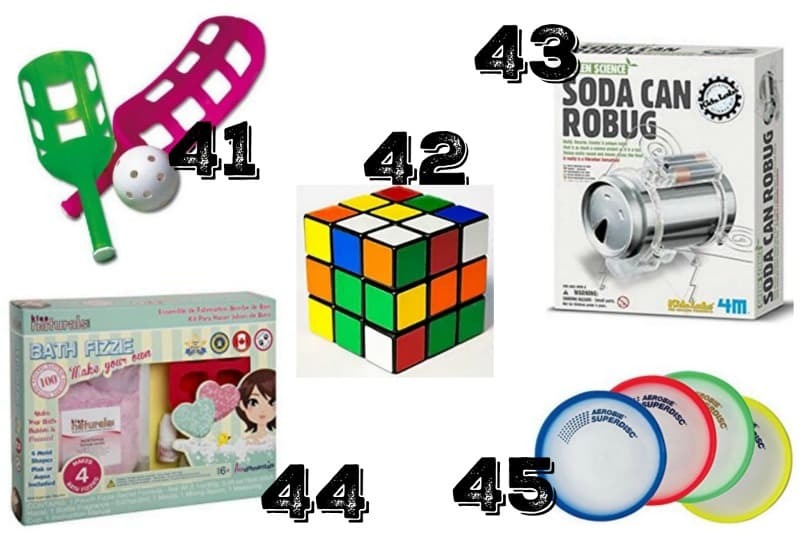 So now you have not just 50, but 100 cheap gifts to choose from! 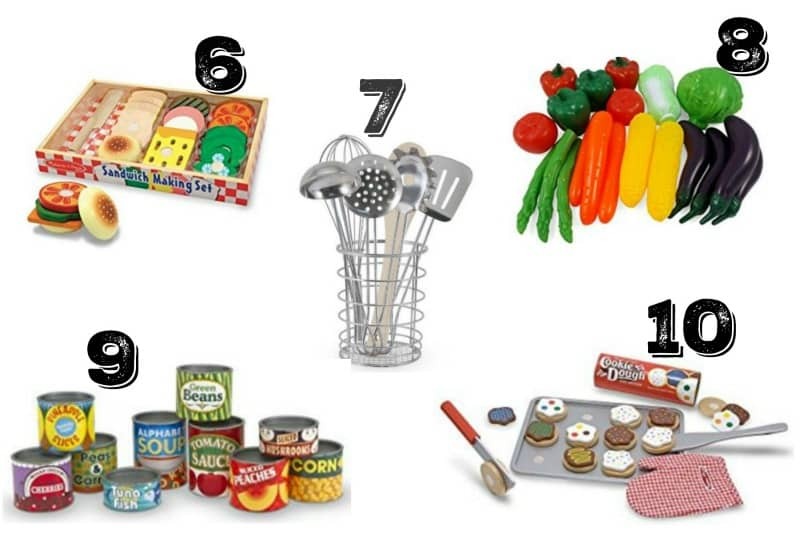 Hopefully the work I did in finding the items on this list can save you all a lot of precious time and money. So, go ahead and save this post to Pinterest, email it to yourself, share it on Facebook. 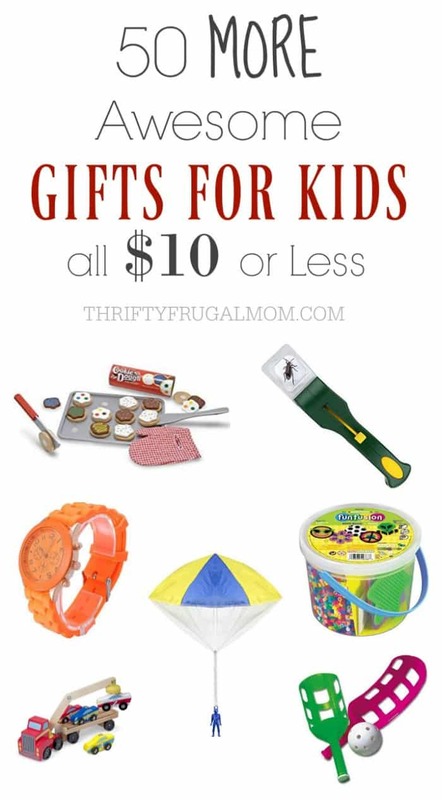 Basically, do whatever it takes to save yourself time later when you find yourself needing an inexpensive birthday gift or a kid’s stocking stuffer gift or you simply want to surprise your child just because, but you don’t want to spend a lot. All the fun of a paper doll, but less fragile! Our daughters love playing with their wooden dress up doll and I love that it comes with a little organizer box to keep all the pieces in. Want a boy version instead? Here you go! These tiaras are perfect for any little girl who loves dress up and dreams of being a princess! 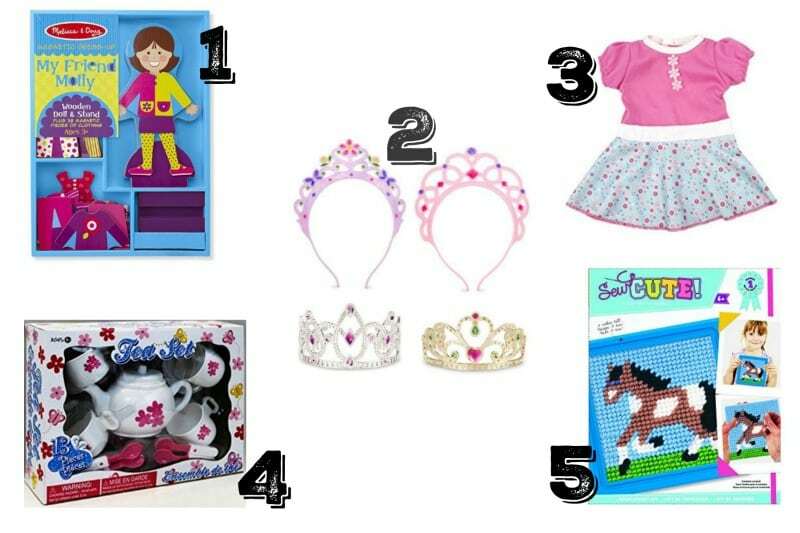 Have a girl who loves American Girl dolls? Then she’ll love this doll dress! Or if she’s into Bitty Babies, try this outfit! This little starter set is just the thing for any little girl who loves pretty dishes and pretend play! The perfect thing to get your child started with needlepoint! If you are interested in a kit that is a bit more advanced, check this one out. Your child will have fun making sandwiches just like mommy and daddy…and they can even use the knife that is included to cut them apart! Just like mommy’s and so fun! Perfect for any little foodie! If you have a toy kitchen or even just have girls like mine who adore playing house, these little cans of food are great! My son loves his pocketknife and always using it to whittle wood or cut strings. If you are looking for a knife for littler kids, here’s a good option. Obviously, this is one of those items that will only work for a child that is trustworthy and that you can count on using it with care. This realistic toy is sure to thrill any little boy! When our son was little, he played with his all the time and it’s still a popular toy with any little boy that visits our house. I haven’t met a child yet who doesn’t think these are fun! 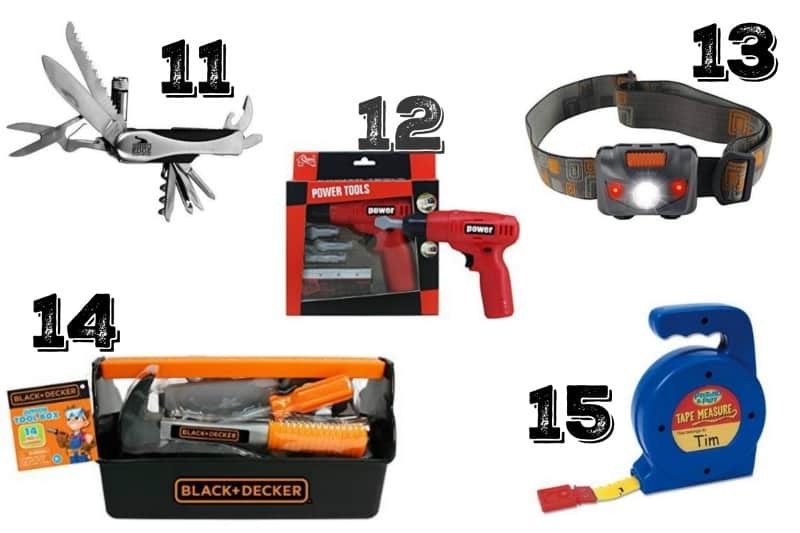 Your little guy can be just like daddy and keep busy being Mr. Handyman! I don’t know what it is about measuring tapes, but our children have all loved playing with ours. They pull it out, let it go back in, pull it out again. It’s provided endless entertainment! The perfect starter K’nex set or great as an addition to any K’nex collector! 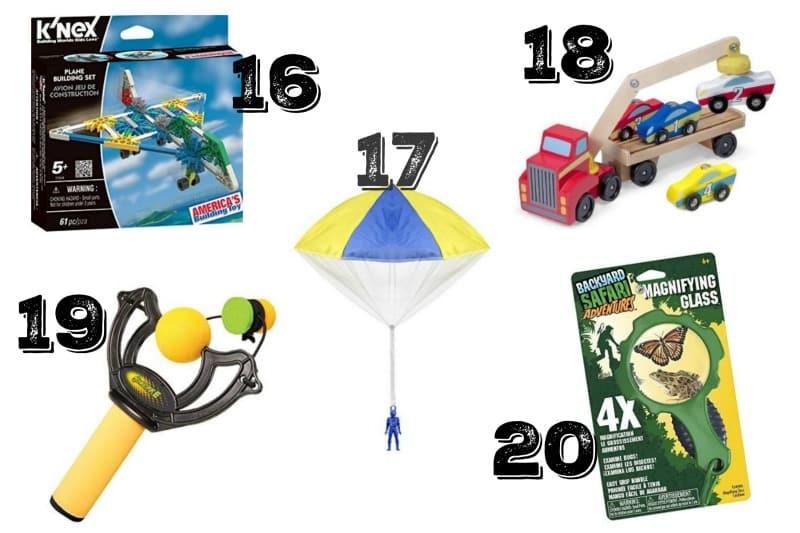 Throw this little man up in the air and have fun watching the parachute billow and float him safely to the ground! It’s tangle free too, so you’ll have hours of frustration free fun! The crane feature on this sturdy truck makes it extra fun! This toy will give you all the fun of a slingshot, but without the potential for damage as a result of your fun! Watch out though- you may end up wanting to play with it yourself! What is it about magnifying glasses that just fascinate kids? My grandparents had one and I remember playing with it often. These markers won’t write on anything except for the special paper that comes with it, creating lots of mess free fun! Great for little ones that aren’t quite ready for regular markers. Our kids love playing with stencils and the addition of texture to these to also create rubbings is so brilliant! I loved using tracing paper as a kid, probably partly because I couldn’t draw for the life of me and tracing paper allowed me to be able to experience what it was like to create a beautiful “drawing”. Not your typical dot to dot….these are super fun and challenging! Perfect for older kids. Have a child that loves to create? Let them be the author and creator of their own story books with this set! 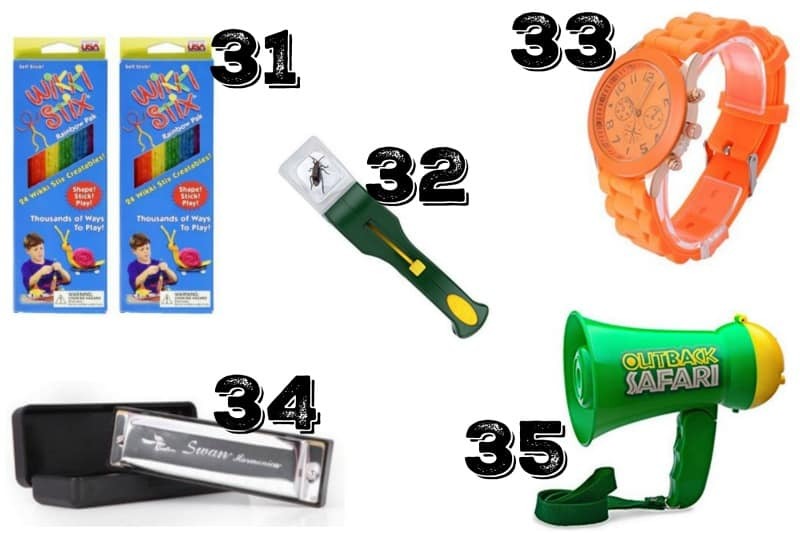 These little toys are great for travel or for just fun, creative entertainment at home! 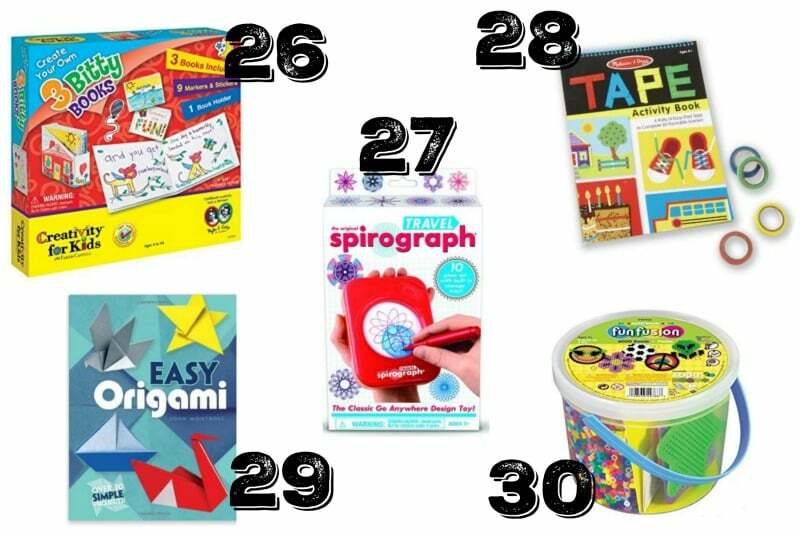 And they’re much easier to manage than the bigger spirograph toys. Oh my. If you have a child that loves tape as much as one of mine does, then this is absolutely perfect! Oragami is so fascinating! Create all sorts of great shapes with the instructions in this book. And you can get oragami paper here. I haven’t seen a kid yet who doesn’t enjoy creating things with perler beads! This set not only includes beads but also several pegboards. 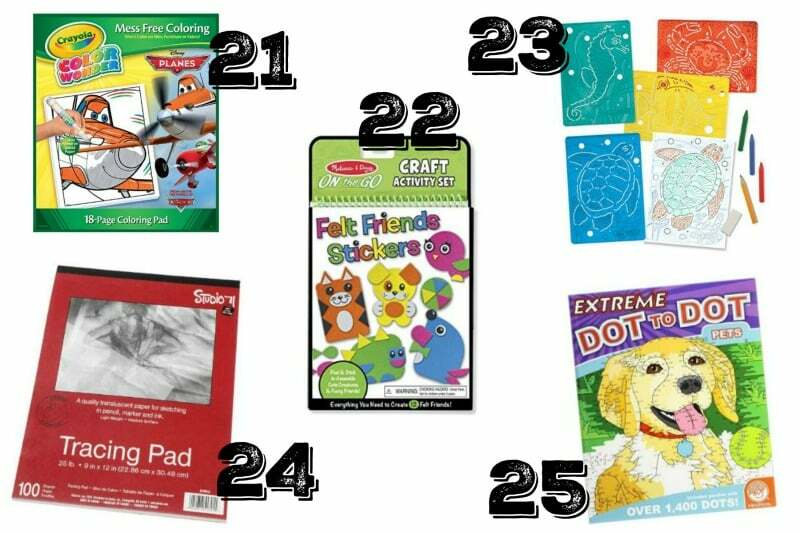 Your child will have a blast twisting and molding these stix into all sorts of creative shapes! I’m ordering this little gadget for our bug loving son. He’s always trying to catch little critters with his bare hands and it doesn’t always work that well. I know this will be a hit! And the reviews of this tool had a lot of adults commenting on how well they love using it to catch bugs in their house. So who knows, I might end up sneaking it to use myself! I think every child enjoys the grown up feeling of having their own watch, and this fun one comes in a lot of different colors! One of those noisy “toys” that is worth it in my books! I’m not a fan of noisy toys, but I could see this one being fun as an outside toy. A fun little “fidget” toy for kids…or adults! We got this for our youngest but our other kids, ages 4 & 7, have had just as much fun with it! In fact, they like it better than their bigger kid flip phone because they say it looks more like a smartphone. It’s held up well and after almost 2 years of being played with daily and really taking a beating, it still works perfectly. Playing with Play-doh is twice the fun with one of these! 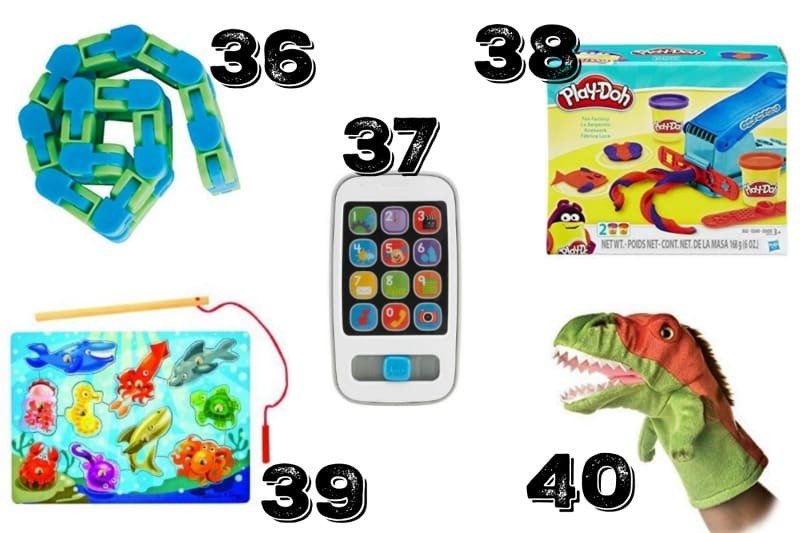 A great little puzzle that helps develop fine motor skills. Inspire creative play with this awesome hand puppet! And if dinosaurs aren’t your thing, there’s also a giraffe, dog, cow and lots of other great options. Great fun for any age! Our 8 year old actually just recently chose one of these as his home school rewards gifts. He loves the challenge of trying to get the sides to match and I’m always finding him fiddling with it! Have a little scientist? They’ll have a blast making this little robot! This kit includes the supplies to make your own bath fizzies and then you get to enjoy using them too! Double fun! Our kids love frisbees, but I’ve been wanting to upgrade to one of these because they are so much easier to catch! A great idea for those kids that love a good puzzle! 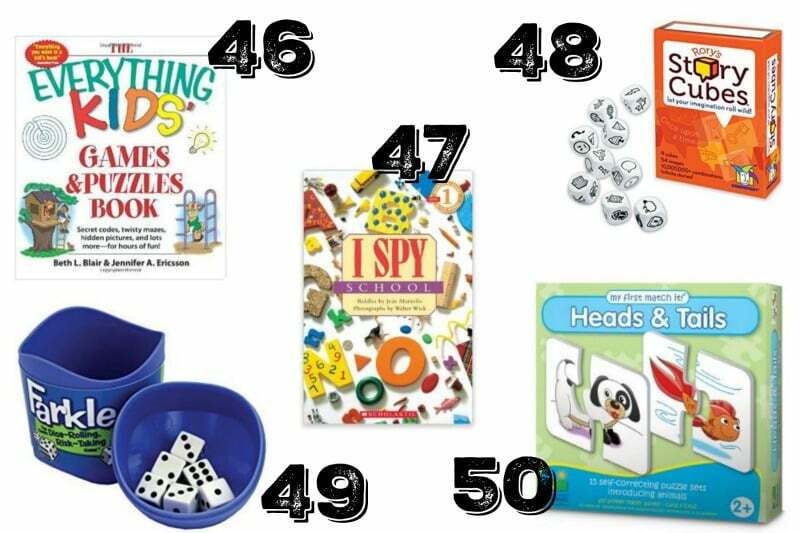 I’ve seen lots of children sit quietly for a long time as they pour over an I Spy book looking for all the hidden items. And there’s even a toddler I Spy version, too! This game provides hours of imaginative play! Your child can use it to create stories on their own or you can play as a group too. A simple, fun game the whole family can enjoy! The perfect starter puzzle for little ones! Our kids have loved theirs! Looking for other cheap gift ideas? Check these out. Glad you found it helpful, Catherine!